When the big multinational Unilever shut down a tea processing plant in the south of France, the workers reacted immediately by occupying their factory. In France there are two cases of recuperated factories occupied by workers during the current crisis. One is the Pilpa Ice Cream Factory, which just started producing organic ice cream and yoghurt as a worker-owned and administered company after a long-lasting struggle. The other is the Fralib Tea Factory. Both were closed by their huge multinational owners to relocate production. Fralib is an herb and fruit tea processing and packaging factory in Gémenos, near Marseille, South France. The plant produced the tea sold under the famous Thé Eléphant brand created 120 years ago, as well as Lipton tea. In September 2010, Dutch-British transnational food giant Unilever, owner of Lipton, decided to close the plant in France and move production to Poland. The workers reacted immediately, occupying the factory and beginning a boycott campaign against Unilever. The union Confédération Générale du Travail (CGT), formerly close to the Communist Party, supports the Fralib workers. “The struggle at Fralib started on September 28 2010. In 2010 we had 182 workers. Now we are 76 workers and still fighting,” comments Gérard Cazorla, mechanic and union secretary at Fralib. 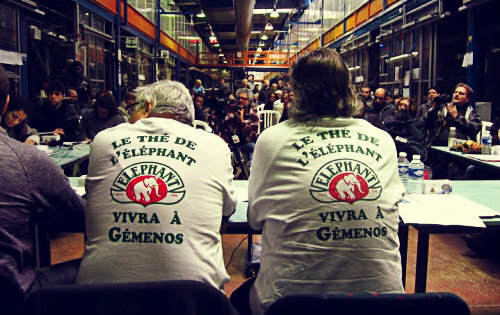 The workers want to restart production in the factory under workers’ control and retain the Thé Eléphant brand, claiming it as regional cultural heritage. They want to switch to producing organic herbal teas, mainly linden tea, relying on regional production. As in most other cases, the self-organized struggle of the Fralib workers has three pillars: the project of production; public protest and the construction of a solidarity campaign; and the legal struggle against Unilever. On January 31 and February 1, 2014 Fralib housed the first European Meeting of “The Economy of the Workers.” More than 200 researchers, supporters and workers from five European factories under worker control participated in the meeting inspired by and directly linked to the world meeting of “The Economy of the Workers,” which takes place every two years and had its third meeting in Brazil in 2013. Researchers from Argentina, Mexico and Brazil also participated in Marseille, as did a worker from the Argentinian textile factory Pigüé. In honor of the meeting and with a nod to the Argentine movement of recuperated factories, the Fralib workers produced boxes of Argentine mate tea. This is not the only link of the Fralib workers to Latin America. The factory occupations in Argentina, so they tell, were their source of inspiration. In a song and video the workers produced to support their struggle the workers call themselves “Los Fralibos”. The Fralib workers are determined to continue their struggle for a workers’ controlled factory. They can count on the solidarity of many movements and workers they reached out to during the past years of campaigning. The workers accomplished that closing procedures and social plans were revoked several times by court order. Fralib closed officially only in September 2012. In March 2013 Unilever stopped paying the workers’ wages despite a court decision that Unilever had to continue paying them.